Update: This sale is over but I recommend highly recommend the author. 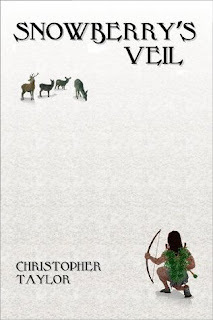 I haven't reviewed this yet, but I just want to let you know that the Kindle edition Snowberry's Veil by Christopher Taylor, author of the excellent Life Unworthy, is on sale today and tomorrow for only 99 cents! Serving the king as a Ranger has never been boring, but once Erkenbrand takes on the responsibility of scouting for a caravan of settlers heading to the wilderness, he faces challenges like never before. Separated from the caravan and stripped of all his gear Erkenbrand must struggle for his life before he can see his love Thealea again. Facing the wilderness, the monsters that dwell there, and the creatures he meets, Erkanbrand is alone with only his skills and will to survive. And behind it all is a dark secret that might doom both Thealea and Erkenbrand. Snowberry's Veil is a departure from the usual world-changing multi-part fantasy epic, taking a more personal look at a smaller adventure. Instead of saving the world from vast evil, this is a more intimate look at one man's struggle to survive and help those around him. Enter a world of strange creatures, magic, and personal struggle; a fight against the harsh wilderness as well as the evil that man can bring.